I’ve been on the internet for years and I know that one thing you need to be able to do online business is an online account. An online account you can use to receive and make payments. There are so many accounts you can use but the one I like most because of security of use and funds is PayPal. No doubt that lots of big sites use this an a means of receiving online payments worldwide. The truth is, as someone living in Nigeria, you can’t utilize your potentials with the power of internet just because you are restricted. Also, PayPal doesn’t have a problem with Nigeria, it’s just a matter of getting some banks in Nigeria to partner with PayPal so that your bank accounts can be linked to PayPal. But till then, here is how to operating a functional PayPal account in Nigeria. First take a look at my personal account I have been using over for 2 years now and I haven’t encounter any single problem not even when I traveled to South Africa last year August 2012 as I make use of my account in offsetting my Hostgator web hosting billing and receive payments via Fiverr into my account in the SA. Owning and operating a functional PayPal account in Nigeria is no longer a new thing as so many so-called and self acclaimed gurus do get through one way or other which later turns out a sour story. Some of this so called called marketers/gurus will even tell you that you safely access PayPal website with proxy server. “But do you know that 98% of such accounts get limited by PayPal within 6 months ! It’s a Fact. How do you guarantee the security of an online account opened and verified by someone else who has the details used in opening such account? I laugh uncontrollably when I came across some of this so called marketers/gurus asking you to access your PayPal account with proxy server. What is the PayPal 101? 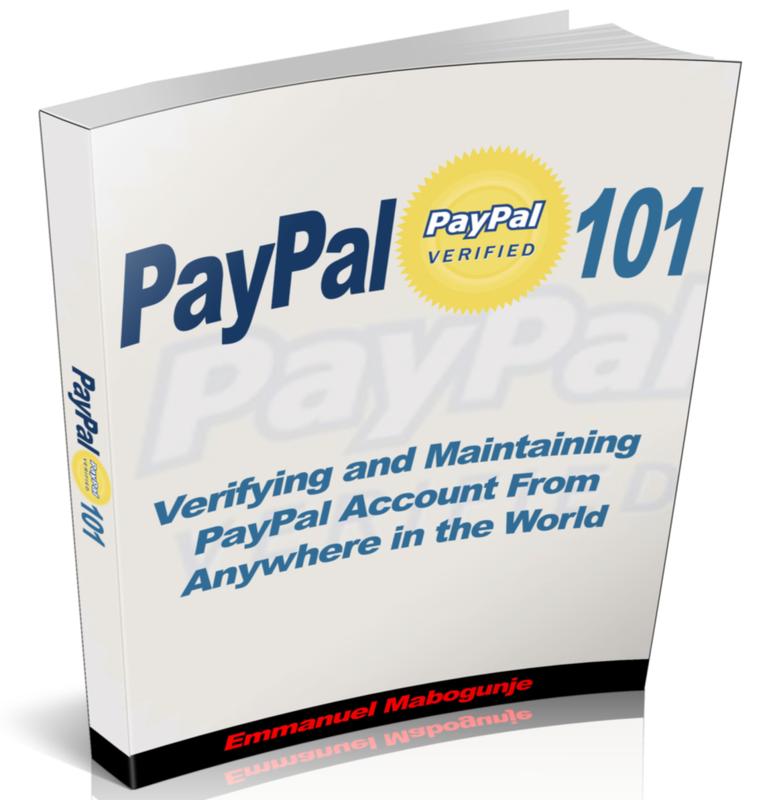 The PayPal 101 has been researched and proven as a guide that will resolve the issues of Paypal account opening and verification, funding and withdrawing, Limitation prevention and much more. We have tried to make all things simple by breaking down the price from specified official price of N7,500 to just N3,999. You should get this beginners guide right now while it is still available! Instruction: After payment, email the following details to [email protected] or text/call 08038500766. Your full names, Your email address, Your payment teller number or simply put “Internet banking” if you paid via internet banking. Your Guide in digital (PDF) format will be sendt to your specified email within 10 minutes of payment confirmation. In case you are reading this from outside Nigeria and your country is part of those restricted from Paypal but you like to get the guide, email us at [email protected] and we will send you an international payment portal. Call 08038500766 if you need more info. Do you have any question? Please ask using the comment box provided below and you’ll get a response. Ever since i came across this site it has been like a gold-mine for me. I recommend this site to everybody especially those who have passion of becoming an online entrepreneur. God bless the person behind this site. I would like to get this paypal material, but i am afraid let my money not enter voice-mail. If it does i will definitely castigate you just the way i am praising you. Nevertheless i recommend you for Nigeria best blog award. I will vote for you over and over. I will also go an extra mile of promoting this your blog for the benefit of other even though you won’t pay me for that. I’m glad you are finding this site very useful. About the PayPal material, your money won’t enter voice-mail oo. I’m not the owner of the guide but I believe the owner will do you and others good. This is why I have it posted on this site. You’ve made it online, why can’t you give this out for free?! Help your brothers out! LOL Jonathan. It is free, you are just paying for the time involved in finding out the method of operating a functional PayPal account in Nigeria. Besides, have you ever seen anyone who doesn’t want to make more money?